You want action? You’ve got it! You want a stunning conclusion? It’s right here! Joshua Williamson has made Eobard Thawne more menacing than ever…more sinister and yet more pathetic an individual, more dangerous and yet more lost. It’s a great conclusion to this arc, setting in motion some intriguing possibilities for future issues. I have some minor qualms, an we’ll get to those, but overall this is an outstanding conclusion to “Running Scared”. Want to know more? Follow us after the jump! 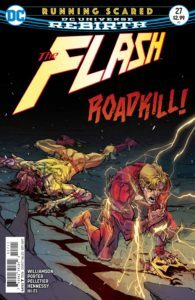 Barry returns from the Negative Speed Force just in time to save Iris West from Thawne. But, this Barry has a very different look, and an attitude to match. The Negative Speed Force has definitely had an impact, and Thawne…loves it! No, not Barry snapping his neck, not this time. And, Iris doesn’t need Barry or anyone else to save her She uses that weapon we saw last issue to take Thawne apart. Whether he ever “recovers” from that will be left to future stories, but I don’t think we’ll see this Reverse Flash again for a while. So, Thawne dead, Iris safe, everything goes back to happy times for Barry and Iris, right? There have been too many secrets hidden here, and there are even secrets that Barry hasn’t (or can’t) tell Iris yet. Iris will have none of that, not right now, and Barry ends this arc truly on his own. NOTES: The Negative Speed Force version of the Flash is truly intimidating. We haven’t seen the last of this look, and as long as this isn’t permanent (and I don’t think it is), then I’m cool with this different appearance of the Scarlet Speedster. That’s part of the great artwork by Paul Pelletier & Howard Porter (pencils), Andrew Hennessy & Porter (inks) and Hi-Fi (colors). It’s not so much a gimmick as it is a most interesting plot device. What will happen with a Flash powered (at least in part) by Thawne’s Negative Speed Force? And, while I’m a HUGE Barry/Iris fan, I’m glad in a way that they didn’t just fall into each other’s arms right here. That would be too easy a resolution. As for qualms, I have just two that I want to mention here. I like the overall take on Thawne in this arc, though in some respects he has become a truly pathetic character. His addled sensibilities make him somewhat of a Joker to Barry’s Batman, and the intensity of the hatred and of the insanity make him a formidable opponent. But, the “want to spend time with you” part of this leaves him a little more pathetic (I keep coming back to that word) than I’ve seen him in years past. As for my other qualm…I really like the idea that Iris didn’t need Barry or anyone else to save her. Still, I’m bothered that we’ve seen her become a murderer, even in self-defense. It is an interesting twist on the Silver-Age story where Iris dies and Barry later snaps Thawne’s neck (something alluded to in this issue – nice nod to the past). Still, I’ll remain a bit torn on that one for a while. That doesn’t keep me from really liking this arc overall, and this issue is a 9/10 to me. Of course, that’s just my opinion – what do YOU think? Leave your comments below! This entry was posted in Reviews and tagged Eobard Thawne, Iris West, Negative Speed Force, Professor Zoom, Reverse Flash, Review, The Flash on July 28, 2017 by Ed Garrett.